Farmhouse Detailing- It’s all about White. Any farm or barn house done entirely in white makes my head spin and heart patter with excitement. 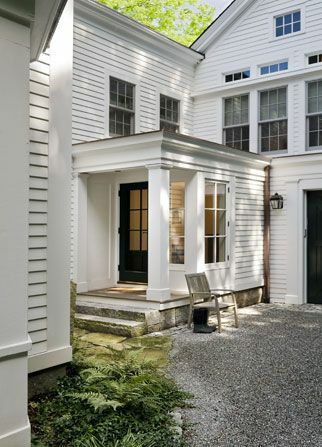 This 1840’s Greek Revival house in the historic center of Lincoln, Massachusetts is done in the one single color and allows the detailing to shine. The architects Van Dam Design ( http://www.vandamdesign.com) based in Portland, Main and Thetford Hill, Vermont.